Once upon a time, a family adopted an ocelot cub because they couldn't resist how cute it was. It's too bad that they conveniently forgot one essential detail: Babies grow up. Finally, the ocelot was just too much pet to handle. Perhaps it decided to sharpen its claws on their sofa or maybe it got a little too rough in its play, or it could have just become too expensive to feed. Whatever the reason they decided to get rid of it. AmaZOOnico to the rescue. Our Amazon tour included an opportunity to visit AmaZOOnico, an animal rescue center near the town of Tena, Ecuador. We quickly learned about traveling in the jungle: It's easiest to travel by water. The growth is so thick that there are few roads through the area. As a result, we all piled into a canoe and headed down the Napo River. This was no Native American-type canoe with paddles, though. It had a gas motor and a roof and could easily carry 20 people. The shores of the Amazon are a tangled mass of impenetrable leaves. Probably branches, too, but they were obscured by the leaves! Were it not for our guide and the AmaZOOnico sign, we’d never have seen it or known the animal rescue center was there. As we climbed out of the boat, a volunteer greeted us and sent us up a set of stairs. The welcome center is not much more than a small building holding a ticket office and small gift shop. The reserve makes a little money from tourism and souvenir sales, but it certainly isn't enough to support itself. AmaZOOnico mainly survives through volunteer labor and the kindness of generous donors worldwide. Our guide was a volunteer from Germany. Volunteers at amaZOOnico work 5 days a week, 7am to 5pm, with 2 days off a week. They work for a minimum of 6 weeks and get a variety of experiences. It is hard but very rewarding work. As she showed us through AmaZOOnico, we learned more about the animal rescue center’s mission. Its primary goal is to try to rehabilitate every animal that comes through its doors and help it return to the wild. The goal is lofty but unfortunately, by the time they arrive at the center, approximately a third of the animals they receive are in such bad condition that they don’t survive. Of the animals that do, half cannot be rehabilitated and will have to remain in captivity. Usually it’s because their senses have become dulled through disuse or because they are no longer afraid of people. The volunteers are thrilled whenever they can bid an animal goodbye one of the remaining animals can be rehabilitated and released back to its natural habitat. As she took us past the various cages our guide told us stories about the animals we were passing. Most of the stories were sad ones: wings clipped so birds could never fly again, pets abandoned by their owners, animals rescued from poachers, or found injured along the road. Here are a few of the animals we saw there. I hope you’ll forgive us for the photos that are out of focus. Dan did the best he could, but animals rarely stop to pose for selfies. 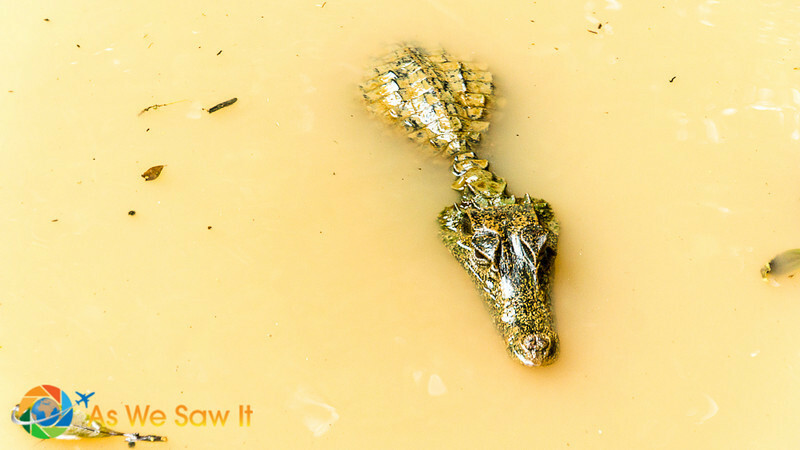 Plus, the most interesting animals were hiding, like the kinkajou and anaconda. 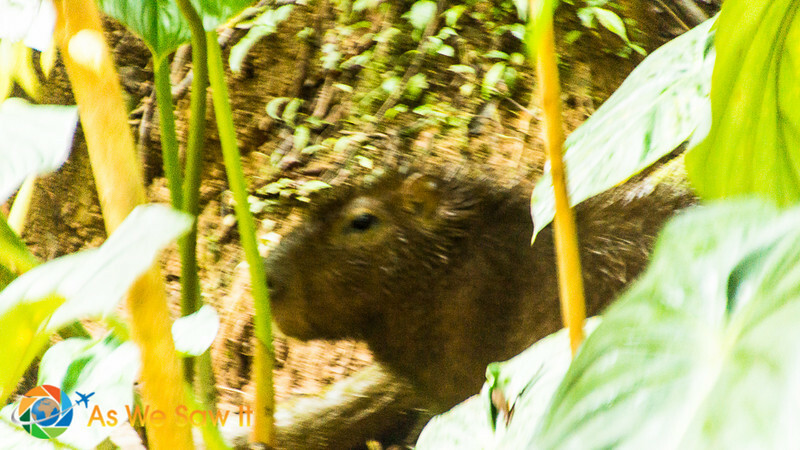 The Amazon is home to a small wild pig called a peccary, and the animal is an important part of the diet for big cats. 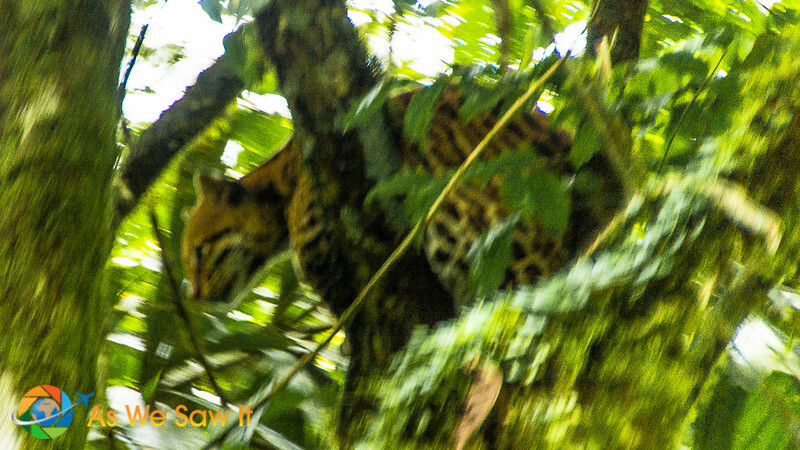 The indigenous peoples hunt them as well, which unbalances the Amazon food chain. To help fix this, AmaZOOnico now raises and sells peccaries to the locals. Getting them to accept the idea has been an uphill battle, but they have been making progress: Recently, three were purchased for a wedding banquet. Here is some more information to help you plan your own trip. 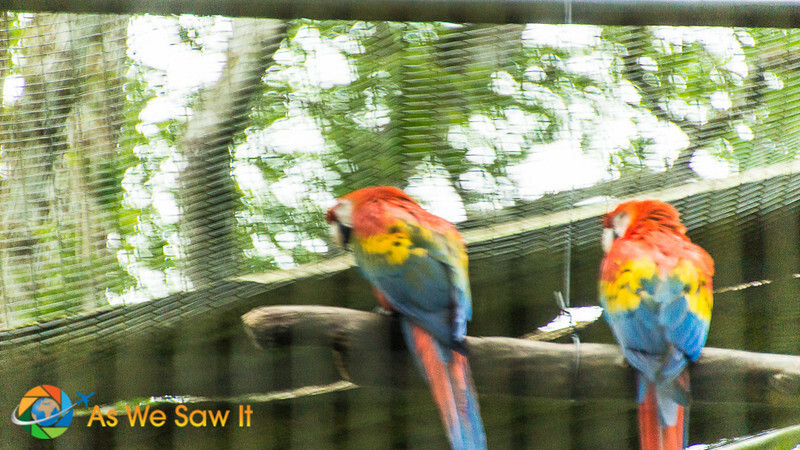 If you want to visit the rescue center, it is located in Tena, Napo, Ecuador. By bus: In Tena, find one of the bus terminals or Centinela Jumandy tena. Take a bus to Puerto Barantilla ($2.50 / 1.5h). By car: From Tena, take the road to Ahuano. When you arrive at the junction of Ahuano, continue straight until you get to Puerto Barantilla (45 min). Once you arrive at Puerto Barantilla, take the motor canoe to AmaZOOnico ($5/15 min). We recommend using HotelsCombined to make your lodging arrangements because they search across multiple booking sites. Compare prices, amenities, and ratings before you book. Easy. 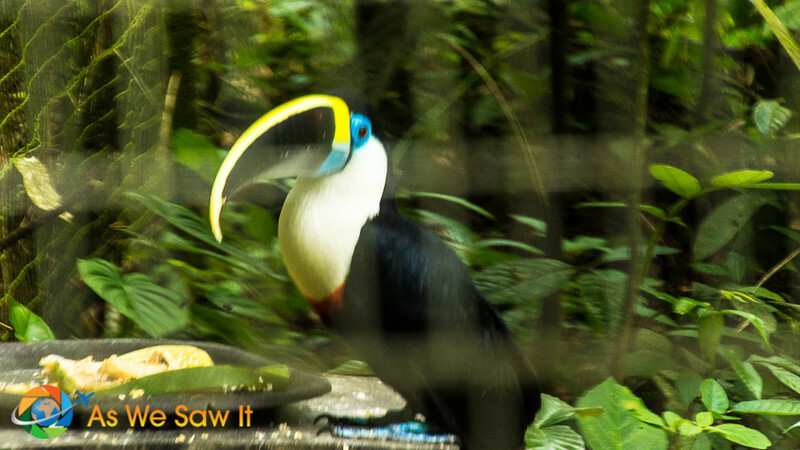 We stayed at Cotococha Amazon Lodge on the Napo River. See our photos from Cotococha. Here are some other stories about Ecuador's Amazon basin. Here are some Ecuador tours that include visits to AmaZOOnico. Pin this to your Pinterest travel board. Loved how you went into the background of many of these beautiful animals at Amazoonico. It’s such a shame for those who can’t be released because they’ve lost the ability to survive in the wild. Hopefully this helps people think twice before purchasing exotic pets! Wonderful to see the work being done by this great organization. We recently visited a similar wildlife rescue in Tasmania. Thank goodness for such places all over the world. Very cool! I’m such a wombat fan. What sorts of animals do they rescue in Tasmania? Very cool! What sorts of animals do they rescue in Tasmania? I’m a fan of wombats; I think they’re pretty cute. Great to read stories like these. Thanks for sharing. This sound like a place to view and help wildlife, which are the types of animal places we like to visit! A worthy cause for sure. 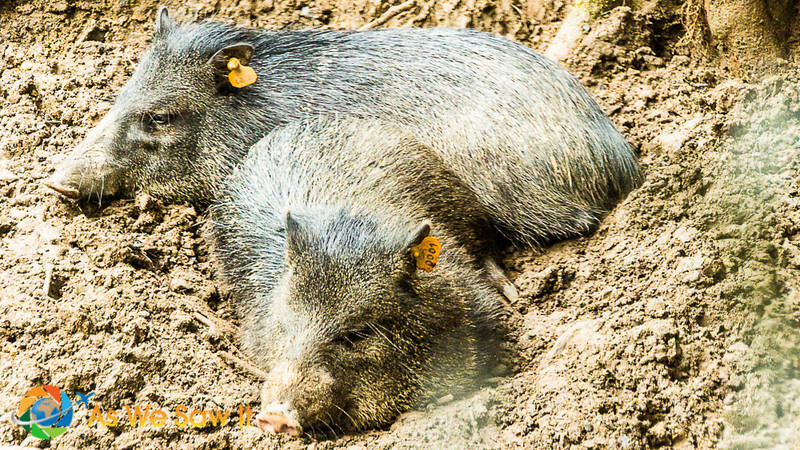 The peccaries are interesting little animals. It is a worthy cause, Jan, and looks to be a wonderful place to volunteer. Nice post. Looks like they’re doing a great job! They are. I like that they care for a variety of critters.